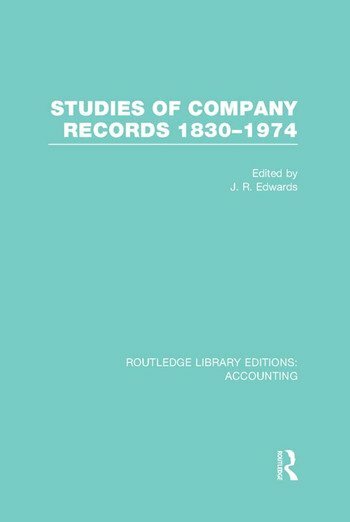 This anthology comprises a selection of articles which demonstrates the explanatory potential of company records as source material for the accounting historian. They were published in the UK and the USA between 1954 and 1984. The articles reproduced are based on the records of what is the modern business enterprise and they identify and explain the development of external financial reporting procedures. @contents:1. The Most Unviersal Quality: Some Nineteenth Century Audit Reports Peter Boys and Brian Rutherford 2. The Accounting Profession and Disclosure in Published Reports, 1925-1935 J. R. Edwards 3. Dowlais Iron Company: Accounting Policies and Procedures for Profit Measurement and Reporting Purposes J. R. Edwards and C. Baber 4. British Capital Accounting Practices and Business Finance 1852 – 1919: An Exemplification J. R. Edwards 5. Company Legislation and Changing Patterns of Disclosure in British Company Accounts 1900-1940 J. R. Edwards 6.discounted Cash Flow and Business Valuation in a Nineteenth Century Merger: A Note J. R. Edwards and Alison Warman 7. The Influence of Company Law on Corporate Reporting Procedures, 1865-1929: An Exemplification J. R. Edwards and K. M. Webb 8. The Development of Group Accounting in the United Kingdom to 1933 J. R. Edwards and K. M. Webb 9. Depreciation in Published Company Reports L. Goldberg 10. The Development of Modern Financial Reporting Practices Among American Manufacturing Corporations David F. Hawkins 11. Fifty Years of Company Accounts Frank H. Jones 12. Company Financial Statements as Source Material for Business Historians Sheila Marriner 13. Railway Auditing – A Report of 1867 Harold Pollins 14. Annual Reports in the United States: A Historical Perspective Allen Schiff.